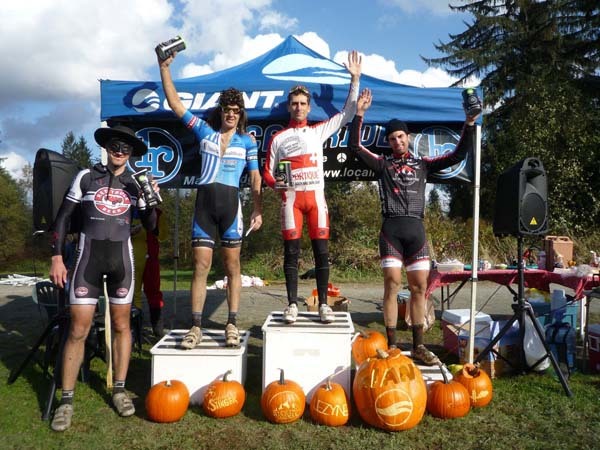 The Fifth Annual Pumpkin Cross BC Cup Cyclo-cross race presented by Local Ride Bike Shop drew a record number of participants to Maple Ridge’s North Alouette River Greenway on Sunday (October 23rd) for a sunny day of cycling madness for the whole family. The event saw over 150 racers in a wide range of categories from beginner to elite, navigate the challenging and fun course, which featured slick grassy corners, dismounts over equestrian jumps, and spooky Halloween-themed obstacles like the Spooky Forest, the Coffin, Lezyne Lake, and the Giant Leap of Faith. Twenty excited kids between the ages of two and 12 took to their very own kid’s course located right by the start/finish and the MC for maximum visibility. “We succeeded in making this edition of Pumpkin Cross better than ever. In addition to record attendance, the costumes were fantastic. 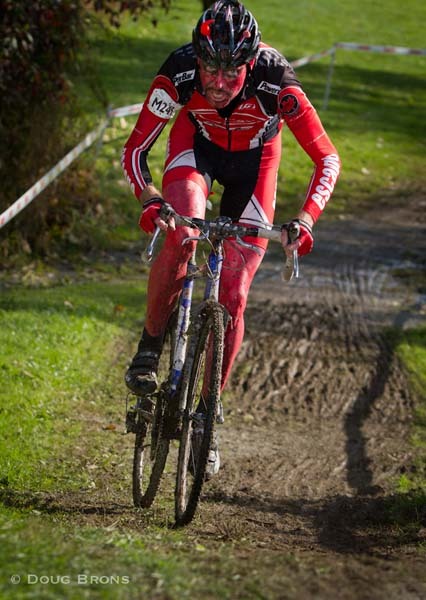 I really thought that was Gene Simmons out there racing a cyclo-cross bike. And the ironic giraffe made everyone smile, not to mention the horse,” said Lyster. Epic battles unfolded in the feature races of the day: the Open Women’s and Elite Men’s competitions. In the women’s event, 2011 UCI Mountain Bike World Champion and Olympian Catharine Pendrel (Luna Pro Team) of Kamloops bested the defending Pumpkin Cross Champion, Maple Ridge’s Jean Ann Berkenpas (XPREZO-BORSAO) after the two duked it out at the front for most of the 45-minute, five-lap race. 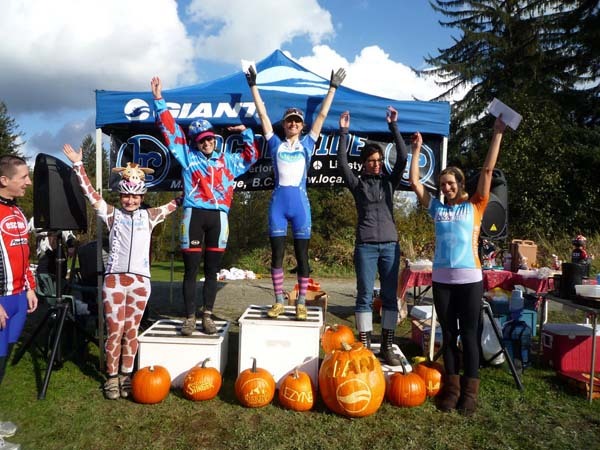 “It was great to see Catharine [Pendrel] join us for Pumpkin Cross. She’s such an inspiration and a true ambassador for the sport,” said Lyster. 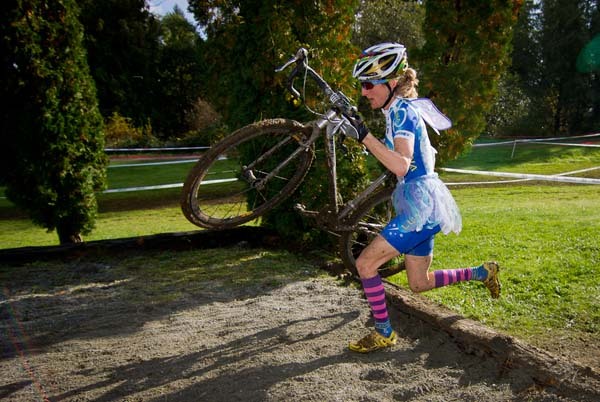 In proper Pumpkin Cross spirit, Pendrel was dressed as a fairy, while Berkenpas chose to honour the top female cyclist who inspired her to pursue the sport. In her retro Team Canada gear and accessories, she held a striking resemblance to Olympic medalist, multiple World Cup winner and World Champion Alison Sydor à la 1995. Completing the podium were Kelly Jones (North Shore Sports Medicine / BSP / Cannondale) in third, Coquitlam’s Sandra Walter (Local Ride Racing) dressed as a giraffe in fourth, and Jenny Lehmann (Local Ride/Dr. Vie Superfoods+) of Vancouver in fifth. With her third place ride, Jones retained the overall BC Cup lead after three events in the six-race series. The 60-minute elite men’s race saw fierce competition for the top three positions between Kevin Noiles (Sportique), Andrew Pinfold (United Healthcare), and North Vancouver’s Kevin Calhoun (Rocky Mountain Factory). In the end, it was BC Cup leader Noiles, who snapped up the victory ahead of a mulletted Pinfold and a hard-fighting Calhoun. Sven Sturm (Red Truck Racing) dressed as Zorro and Maple Ridge’s Mike “the Bumblebee” Berkenpas (Local Ride Racing) finished fourth and fifth, respectively. Perhaps the most important and spectacular competition of the day was the annual Pumpkin Cross costume contest with the winner determined by popular vote from the crowd. This year, the voting for three costumes in particular was extremely tight. Finally, when the ballots were counted, it was Local Ride Racing’s Richard Machhein of Port Coquitlam, dressed as a horse complete with jockey and long, flowing tail, who took home the top prize Kicking Horse Coffee gift pack. The first and second runners up also earned valuable Kicking Horse Coffee prizes for their fabulous get-ups. One was ACDC's Angus Young, complete with an electric guitar, which he played during his race as he rode no-hands on the flat open sections, the other a very convincing version of Gene Simmons from KISS. Glenowyn Carlson (Team Alliance) raced well to win the 45-minute Master Women’s competition, despite dropping her chain twice. Barb Zimich (Zimich Performance Coaching) took second spot, followed by Local Ride Racing’s Jeanine Ball of Vancouver in third, and team mate Sue Weston of Pitt Meadows in fourth. In the Master 1/2 Men’s race, Bob Welbourn (Cannondale CX West) schooled some tough competition in the form of Chris McNeil and Kim Steed (Steed Cycles) of North Vancouver to take the win. Maple Ridge’s Roy McBeth (CanWii) finished 17th in the category. Wai-Ben Wong (Glotman Simpson) scored the win in the Cat 3/4 Men’s race after playing cat and mouse for most of the race with fellow podium-mates Adam de Vos (Oak Bay Bikes) and Maple Ridge’s Brett Wakefield (Local Ride Racing). Machhein’s winning costume may have hindered him in his debut cyclo-cross race, but he was happy with his day. He finished 17th. Keith Wilson of Kamloops won the Master 3/4 Men’s race, using his impressive technical skills to gain the advantage over his competitors. According to Wilson, he dismounted only once during his entire race, when most people were off their bikes to surmount obstacles four or five times per lap. This was not the case for Wilson, who bunny-hopped the double barriers and rode up the Giant Leap of Faith cleanly in each of his six laps. Jussi Jaakkola and Chris Sayers finished second and third, respectively. Port Moody’s Ryan Newsome, a.k.a. Shrek, was Local Ride Racing’s top finisher in the Master 3/4 Men’s category, with an eight-place ride. Maple Ridge’s Brian Griffin (Team Alliance), who broke his hip last spring, rode to an impressive ninth place. Ryan Jeans (Local Ride Racing) of Port Moody finished 29th, with Paul Craig (Local Ride Racing) of Pitt Meadows in 36th. Kristin Campbell took top honours in the Citizen Women’s race, with Rosemary Gin and Amy Saari-Roth taking second and third spots. Dylan Doubt (Poler Stuff) won the Citizen Men’s competition, followed in second position by Andrew Tuovinen and Gary Bone in third. Paul Nash (Giant Bicycles), General Manager of Giant Bicycles Canada, dressed as a knight, finished 15th in the race, despite a costume malfunction, which necessitated the removal of his pants with the help of supportive bystanders. Maple Ridge’s young cyclo-cross star, Maggie Coles-Lyster (Local Ride/Dr. Vie Superfoods+), sped to an easy victory in the U17 women’s category, passing countless riders in other categories along the way in her colourful hippy outfit. The U17 Men’s race was stacked with the attendance of the Team Squamish youth squad, which swept the top five. Luke Di Marzo (Team Squamish) won the race, with Ethan Toom (Team Squamish) and Carsten Lapointe (Team Squamish) rounding out the top three. Pete Whalen (Local Ride Racing) of Pitt Meadows finished sixth. 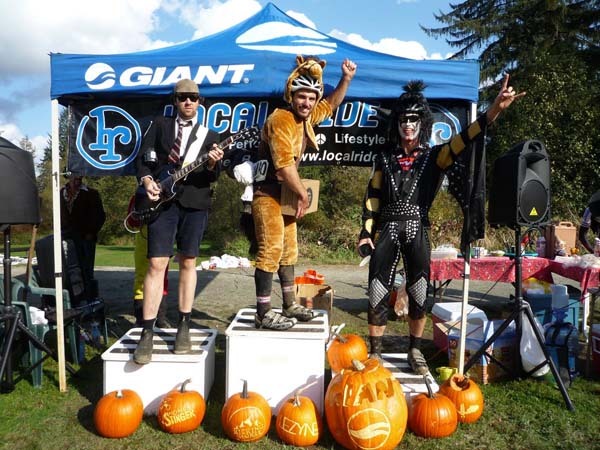 The Halloween-themed cyclocross mania called Pumpkin Cross was made possible by the following fabulous sponsors: Local Ride Bike Shop, Giant Bicycles Canada, District of Maple Ridge, Cycles Lambert, Lezyne Engineered Design, Pedros Tools, Kicking Horse Coffee, Maple Ridge Equi-Sport Centre.